The IVS holds a technical meeting, called the General Meeting, every two years. The purpose of the meeting is to assemble representatives from all IVS components to share information, hear reports, and plan future activities. The meeting also provides a forum for interaction with other members of the VLBI and Earth science communities. 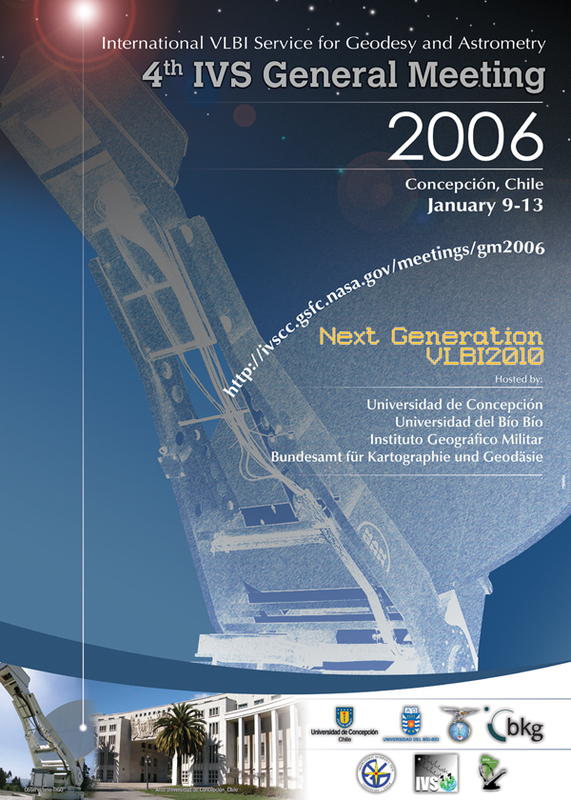 The keynote of the fourth General Meeting will be the next generation VLBI system following the main theme of "Next Generation VLBI2010". A new geodetic VLBI instrument that will meet requirements for the coming decades is envisioned to have small, fast moving antennas, high-speed networks, new correlator systems, and a streamlined data analysis pipeline. Now is the time to initiate system studies and simulations as well as development projects and prototyping to help bring this vision into reality. Keynote speakers will be asked to address the keynote in their presentations. The meeting will be held on the campus of the Universidad de Concepción, Concepción, Chile. The university provides a Wireless LAN (red inalámbrica) at no cost to the user. Your laptop will detect automatically the network "UdeC_Wi-Fi". You should be able to use this network if your laptop supports WiFi 8002.11b or 8002.11g. The Wep passcode is "wi-fi". Please read more information on the service at http://www.udec.cl/wifi/index.php (in Spanish). The LOC is arranging a pre-meeting technical visit to ESO's Paranal Observatory, an optical interferometer near Antofagasta, northern Chile. The visit is scheduled for Saturday, January 7, 2006. Please visit the excursion page for the details. The overall schedule of the week includes the General Meeting sessions plus related meetings. Send a fax to Mrs Jessica Burgos at the number +56-41-403700 and mention the keywords "IVS General Meeting 2006". Send an email to Mrs Jessica Burgos and mention the keywords "IVS General Meeting 2006". If you need support for making the hotel reservation please contact Jenny Neumann. The hotel bill ("factura") can be paid with a major credit card. If you pay in US dollar and ask for a "factura de exportación", you will be exempt from the value added tax (Impuesto sobre el Valor Añadido, IVA). Hotel Diego de Almagro has two floors with WLAN access on the rooms (levels 10 and 11) and offers three computers with Internet access in the office center (open 24 hours). It is a pleasant 15-minute-walk from the hotel to the conference hall on the campus of the University of Concepción covering a distance of about 1200 m (11 blocks) and passing through the Parque Ecuador. You may also take a taxi. The city center of Concepción is in walking distance and can be reached in less than 10 minutes. An airport pick-up service is available for about 3.000 CLP (6 USD), the ride takes about 15 minutes by car. The Hotel Diego de Almagro is represented by a red dot with the number "4" in the town center map. The opening ceremony of the meeting will be held at Casa del Arte (2 in campus map), the oral sessions will be held in the Fac. Ingeniería (15), the poster area will be between Fac. Cs. Químicas (11) and the Foro Universitario (28), and lunch will be available at the Casino Los Patos (17). The registration fee is $220 US payable at the meeting. Payment can be accepted only in US dollars or the equivalent in Chilean pesos in cash. It includes conference materials, conference dinner, coffee breaks, and transfer to TIGO. The deadline for registering was December 9, 2005. Late registration was accepted until December 23, 2005. Online registration is now closed and participants must register on-site at the meeting. Hard copies will be provided to particpants at the meeting. Jinling Li The outstanding VLBI results available today are valuable for various fields of science and are needed for many practical applications. The contribution of VLBI to IAG's GGOS (Global Geodetic Observing System) project and to multi-disciplinary research will be demonstrated. Arthur Niell A major focus of the IVS over the past several years has been the development of a long range plan for geodetic VLBI. The final report of WG3 entitled "VLBI2010: Current and Future Requirements for Geodetic VLBI Systems" recommends 13 areas for further work, split equally between system studies and actual prototyping efforts. Gaining this knowledge is critical for both developing a rational plan for the future and for defining a detailed specification for the next generation geodetic VLBI system. This session will report on any efforts (proposed, underway or complete) intended to shed light on these remaining questions. We invite contributions on creative new ideas for all aspects of geodetic VLBI, including such topics as antenna construction and configuration, observing scenarios, advanced correlator design, modeling and analysis strategies, and estimation methods. Ed Himwich This session focuses on the recent activities and future plans at VLBI networks, stations and correlators. Presentations about issues that relate to improving VLBI data quality in general and more particularly with regard to "VLBI2010" are solicited. Also welcome are submissions concerning the GGOS Project's contributions to local surveys to determine the spacial vectors from the radio telescopes to co-located geodetic instruments. Network station status reports should be submitted to this session, but should be presented as poster papers. Gino Tuccari This session will concentrate on new technology developments in VLBI that have occurred recently or are currently in development. Included (but not limited to) are such topics as 1) development of digital processing technologies in the VLBI signal chain that are expected to soon replace traditional analog BBC’s, 2) continuing development and deployment of advanced high-data-rate disk-based recording systems, 3) transmission of raw VLBI data via high speed networks, dubbed ‘e-VLBI’, 4) new correlator technologies and techniques, 5) RFI excision techniques, 6) advanced calibration techniques and 7) automation of station operations. Contributors to the session are encouraged to report their progress and ideas on new technologies and methods, and to show how these new developments will improve the overall VLBI program. Johannes Boehm One of the objectives of IVS is to serve users with the most accurate and reliable VLBI products. A broad variety of analysis strategies and software of high quality is important for two reasons: Firstly, results of single Analysis Centers can be cross-checked concerning gross errors and the influence of subjective decisions of individual analysts can be identified or reduced. Secondly, VLBI data analysis will benefit from a constant constructive competition and interchange of different ideas. Analysis Centers are invited to contribute papers related to their current activities on the development and comparison of analysis strategies, models and software. Dan MacMillan The analysis of VLBI observations produces time series, long-term average positions and rates, and values of physical parameters. Suggested topics include the use of such VLBI results in modeling geophysical fluids from the atmosphere to the core, nutation/precession, high frequency Earth orientation, refinement of the terrestrial and celestial reference frames, interpretation of the motions of specific sites and sources, astrophysical investigations, tests of relativity, and other scientific uses of geodetic and astrometric VLBI data. Also included are investigations of the troposphere and the ionosphere by VLBI. Another area is the comparison, validation and combination of VLBI with other space geodetic techniques, and the integration of the techniques within the framework of IAG's GGOS project. Abstract submission is closed. If you want to submit a late abstract, please contact Dirk Behrend. All oral papers are 15 minutes, including discussion. Invited papers are 25 minutes, including discussion. Presentation equipment will include a PC projector (plus laptop), one overhead projector, a wireless microphone for the speaker, and a laser pointer. Oral contributions are to be uploaded prior to the session. This should be done the day before the session (or earlier) at the registration desk. The registration desk will be located at the hotel (Sala Llanquihue) on Sunday, January 8, and in front of the auditorium Monday through Wednesday, January 9-11. The auditorium is on the campus of Universidad de Concepción in the Facultad de Ingeniería. The space available for posters will be 180cm tall by 100cm wide. Posters may be put up in the poster area Monday morning. Posters will be left up for the duration of the meeting till Thursday 17:00. Papers presented at the General Meeting will be published in a volume of Proceedings. The proceedings will be published as a NASA Conference Publication. The reference should be cited as follows: IVS 2006 General Meeting Proceedings, edited by D. Behrend and K. D. Baver, NASA/CP-2006-214140. Authors must follow the instructions for manuscript submission. The deadline for submission of files for publication is February 10, 2006. The "Journal of Geodesy" (JoG) will dedicate a Special Issue to VLBI to be edited by Harald Schuh, Axel Nothnagel and Chopo Ma. Submission deadline for contributions to the JoG Special Issue will be the end of March (there will be a separate call for contributions). General Meeting proceedings authors should consider submitting a contribution to Journal of Geodesy in addition to the proceedings paper. The papers should be different, however. Authors may submit, for instance, a shorter version to the proceedings (extended abstract) and a longer one to JoG. Or they prepare two papers highlighting different parts of their research work. The special issue has an allowance of about 10 papers. All oral presentations that were given at the meeting are available for downloading. You can either browse all presentation files or go to the presentations page that will provide you with individual links to the presentations. Summer School on Radioastronomy and Interferometry — Postponed to later date! The Astronomy Group of the Universidad de Concepción (UdeC) was planning to hold a Summer School on "Radioastronomy and Interferometry" directly following the General Meeting. But for logistical constraints, the school had to be postponed to a later date. Thus, a participation in that school is not possible. Visa. For the majority of nationalities no visa is required. The Chilean authorities will issue a tourist card and entry stamp that allow a stay of 90 days at the port of entry (usually the airport of Santiago de Chile). A passport is obligatory. To check if special visa requirements apply to your nationality, visit the web site of the Ministry of Foreign Affairs (SI = yes, NO = no) or contact a Chilean Embassy/Consulate in your country. Time. Chile observes daylight saving time during the (southern) summer months and is then 3 hours behind Univsersal Time: Chilean summer time = UTC–3hrs. Arriving in Chile. International flights arrive at SCL Arturo Benitez Airport in the country's capital Santiago de Chile. The airport consists of an international and a national terminal. US, Canadian, Mexican, and Australian citizens first have to pay a "reciprocity" fee. This fee is imposed in response to a similar fee Chilean citizens have to pay for visas to these countries (reciprocity law). This payment is valid for the life of the passport and currently amounts to: U.S.A (US$100), Canada (US$55), Mexico (US$15), and Australia (US$48). Payment must be made in US cash and for the exact amount. With your filled out immigration form (usually distributed during the flight) proceed to the immigration area where you will receive a stamp in your passport together with a carbon copy of your form. You must present this stamped form upon leaving the country again! After passing immigration you will have to pick up your luggage in Santiago regardless of whether it was checked through to another Chilean destination or not. You have to clear customs and pass the Agricultural and Livestock Service (SAG). You must declare any agricultural product by filling out a second form (also distributed during the flight) as an official statement. SAG will x-ray your luggage to check. In order to avoid problems, we recommend that you travel without any agricultural products to Chile. After passing the SAG service you can leave the restricted access area. Bienvenido a Chile. For your connecting domestic flight, take the elevator to your right and go to the third level—Departure. Leaving the elevator, orientate yourself to the right and proceed to the domestic terminal. Check in your luggage again and follow the instructions. Money. Chile's official currency is the Chilean Peso. You may change cash at exchange offices to be found, for instance, at the airport in Santiago or in the downtown area. Please note that you need to present your passport. Banks and hotels offer usually less attractive exchange rates. The exchange rates change constantly. The exchange rate of December 6, 2005 gives an idea of the relative value: 1 USD = 510 CLP, 1 EUR = 602 CLP. Automatic Teller Machines (ATMs) are called RedBanca in Chile and are found in many towns. Most teller machines accept cards with VISA Plus, Maestro, VISA, or Mastercard signs. Small bills (taxi, bus, meal, drink, newspaper, tip) are expected to be payed in cash. But avoid carrying large amounts of cash with you. Language. Chile's official language is Spanish. Only a few Chileans feel comfortable speaking English. Hence, your trip to Chile is an excellent opporturnity to practice your Spanish. The conference language will be English. Crime. In comparison to other Latin American countries, Chile is not a high-crime country. Still, pick-pocketing is not unknown and you should avoid carrying large amounts of money. Being a foreigner (gringo) enhances the chances of being targeted. Take special care of your documents, money cards, and electronic devices. Always carry a small amount of money at an easily accesible place (not your purse!) for unwanted situations. Depending on the town area and time of the day/night, strolling is more or less safe. For increased security go out in a group and return before midnight. Electricity. The electrical power in Chile is 220 V AC at 50 Hz. The power outlets are compatible with Euro-AV connectors (two round pins). IVS will send a letter of invitation to attend the meeting as a means of support. If this would be of assistance for your travel plans, please contact the IVS Coordinating Center to request a letter. If you need a letter from the Chilean meeting host, please contact Hayo Hase.